Arepa flour, paired with Mozzarella cheese, formed into a 4” diameter medallion. A culinary canvas, designed to stack or stuff with an ever growing arsenal of accompaniments. Influenced by the classic Latin American cuisine, Kabobs’ Large Arepa provides a creamy, moist center versatile base to build-upon. Consisting of Arepa flour, and Mozzarella , the arepa can be baked or griddled, creating a crisp exterior, with a dense, moist center. From frozen place on low Pre-Heated flat top with a little oil and cook for 3-4 min on both sides (traditional method). From frozen bake in a Pre-Heated 350 °F Convection Oven for 10-12 minutes or until done. Stuff: Create traditional South American Arepa-style sandwiches. Splice, and stuff with a variety of fresh ingredients. 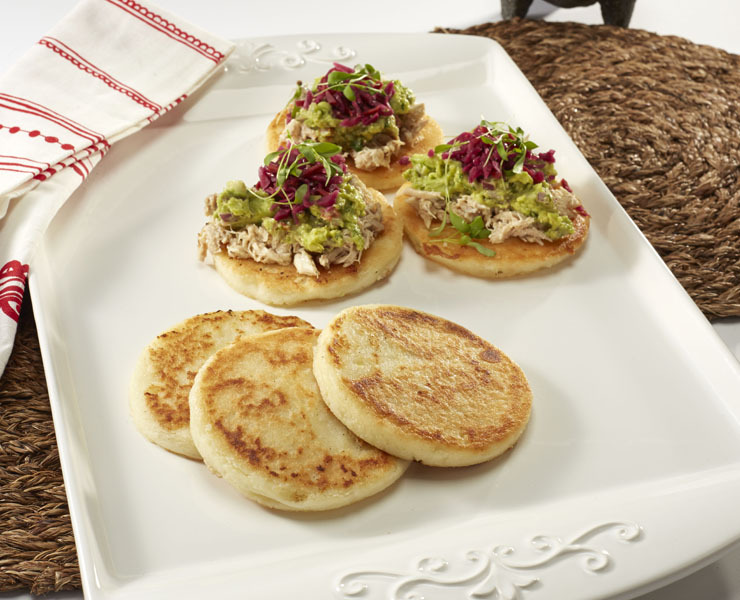 Layer: Combine two arepas to create a layered look, filled with any assortment of ingredients. A savory blend of Monterey Jack, Mozzarella, and Gruyere cheese, lightly folded in egg, placed in our rich, flaky buttermilk biscuit, and brushed with extra virgin olive oil.